Kumara Softball Club Formed -1987. The first team, senior women, was entered in the West Coast Softball Association Competition in 1987. The club then fielded their first junior team soon after (a requirement if a club fielded a team in the senior competition). The Kumara Junior players then began their inspirational journey; many eventually rising to the top in the premier grades. By 2001, the Kumara Club won 12 out of the possible 13 trophies: Premier and Junior Grades. During these years many spectators were entertained by a bunch of young players who played the game way beyond their years. The club was successful due to the fact that the Kumara Community got right behind the teams, and their support was phenomenal. 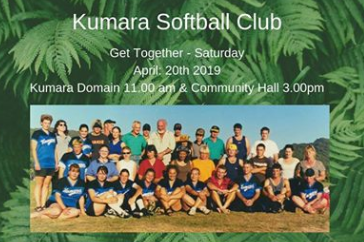 We hope past players, coaches, managers, and supporters can make the time to catch up at a get together in Kumara during this Easter - 2019.